Today, the United Nations Office for the Coordination of Humanitarian Affairs (OCHA) in the occupied Palestinian territory (oPt) released a summary of data collected during 2018. Further breakdowns and statistics from previous years are available through the links below. A total of 295 Palestinians were killed and over 29,000 were injured in 2018 by Israeli forces. This is the highest death toll in a single year since the Gaza conflict of 2014 and the highest number of injuries recorded since OCHA began documenting casualties in the oPt in 2005. In 2018, OCHA recorded 265 incidents where Israeli settlers killed or injured Palestinians or damaged Palestinian property, marking a 69 per cent increase compared with 2017; as a result, one Palestinian woman was killed, and another 115 Palestinians were injured (another two Palestinian suspected perpetrators of attacks were killed by Israeli settlers). Palestinian property vandalized by settlers includes some 7,900 trees and about 540 vehicles. There were at least 181 incidents where Palestinians killed or injured settlers and other Israeli civilians in the West Bank or damaged Israeli property, a 28 per cent decline compared with the previous year. However, the number of Israelis killed in these incidents in 2018 (seven), increased compared to 2017 (four). 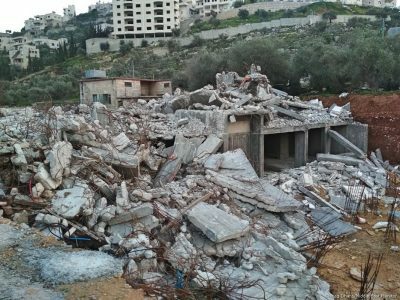 In 2018, the Israeli authorities demolished or seized 459 Palestinian structures across the West Bank, mostly in Area C and East Jerusalem, overwhelmingly on the grounds of a lack of Israeli-issued building permits, which are almost impossible to obtain, slightly more than in 2017. Such incidents displaced 472 Palestinians, including 216 children and 127 women, the lowest such figure since OCHA began systematically recording demolitions in 2009. In Area C alone, there are over 13,000 pending demolition orders, including 40 issued against schools. The land, sea and air blockade on the Gaza Strip, imposed by Israel citing security concerns, continued, with people being able to exit on an exceptional basis only. On a monthly average, in 2018 (Jan-Nov) there were some 9,200 exits from Gaza by permit holders through the Israeli-controlled Erezcrossing, a 33 per cent increase compared to 2017, but 35 per cent less than the 2015-2016 average. The Egyptian-controlled Rafah Crossing has opened on a regular basis since May, recording about 56,800 exits in all of 2018, up from a yearly average of less than 19,000 in 2015-2017. The rate of approval of permit applications for UN national staff to leave Gaza stood at 59 per cent during 2018, up from 47 per cent in 2017. However, the total number of applications submitted in 2018 dropped by 24 per cent, primarily due to the larger number of staff that were denied for security reasons and banned for reapplying for 12 months, currently 131 compared to 41 staff by the end of 2017. Kerem Shalom, controlled by Israel, remained the almost exclusive crossing for the movement of commodities to and from Gaza, with limited imports also allowed via the Salah Ad Din Gate on the border with Egypt. On a monthly average, about 8,300 truckloads of goods entered Gaza via both crossings in 2018, 17 per cent below the equivalent average in the previous two years, while 209 trucks exited Gaza on average, mostly to West Bank markets, nearly the same as in 2016-2017. Access to fishing areas and to farming lands near the fence inside Gaza remained restricted. About 1.3 million people in Gaza, or 68 per cent of the population, were identified as food insecure in 2018, primarily due to poverty, up from 59 per cent in 2014, when a similar survey was conducted. The unemployment rate in Gaza reached an average of almost 53 per cent in the first three quarters of 2018, an all-time record, with youth unemployment at 69 per cent. By contrast, in the West Bank, 12 per cent of the Palestinians are food insecure, down from 15 per cent in 2014, while unemployment stood at an average of 18 per cent. Note: Data on casualties and demolitions is as of 26 December 2018 and is subject to caveats and definitions available in these links. Israeli fatalities exclude a baby delivered prematurely after the injury of his mother. Data on exits via Erez crossing is up to 30 November 2018, and data on imports and exports, as well as on the Rafah crossing are as of 15 December 2018.